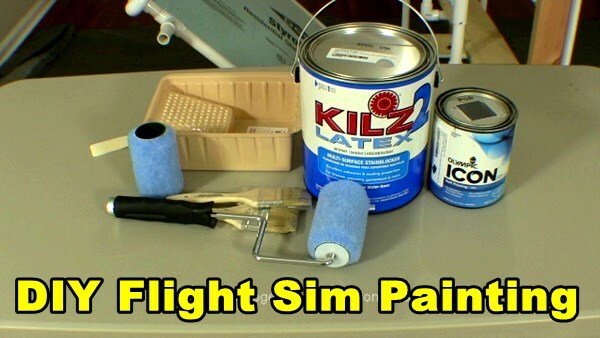 Proper flight sim painting will make your home flight simulator look finished and professional. The paint has an almost magical transformative effect. Most importantly, it turns a framework of pipes, wood, and foam into a complete, comprehensive aviation solution. Check out these # tips for flight sim painting. Latex primer. Ask the paint associate at the store to tint this to your desired color. Latex primer covers well and it dries with a flat sheen (not glossy). Paper towels and a household cleaner like Formula 409 or something similar. Clean the PVC pipe frame before painting. PVC pipe can be rather dusty, even when it’s brand new. Disposable 2″ wide paint brushes for the pipe frame. These can be re-used and then later thrown away. 3″ wide paint rollers (and handle) for foam body panels. If you have many wood boards to paint, then also use the rollers for those. If you only have a couple of boards, the brush will do. Paint tray for the rollers. Plastic drop cloths to catch drips. Scrap boards to prop up the frame for painting. Quart ziplock bags and gallon ziplock bags. Yes, you can tint latex primer. The store clerk might tell you that the color may not turn out exactly the same as the paint chip because it’s primer. That’s ok, just tell them you are a pro at flight sim painting and you know what you’re doing. Dover Gray D58-4 by Olympic. 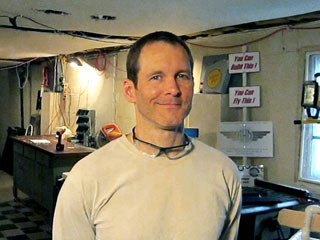 This is a light gray that I use for nearly all of my DIY Flight Sim projects. Knight’s Armor D25-5: This is a dark gray that I use for the windows of the DIY Flight Sim Pod and the frame for the DIY Deluxe Desktop Flight Sim. You don’t have to use these exact colors for your flight sim painting project. One builder reported a problem using Olympic paint + primer combo on PVC pipes. He said it did not to adhere adequately to the PVC. On the other hand, I haven’t heard of any other builders that encountered that problem. It might be best to just stick with regular latex primer. Tip 3: How Many Coats? I usually end up putting three coats on a flight sim painting project. Especially when it is a simple PVC frame like Item #F311 DIY Side Joystick Frame. First of all, start painting the frame right side up and allow it to dry. Next, turn the framework upside down and you’ll see all the places you missed. Apply another coat and allow it to dry. Finally, flip the framework right side up again and apply the final coat. Usually, I remove the wood boards from the frame, label them, and then paint them separately. That’s actually much easier than keeping them in place. You can use your brush and roller multiple times without worrying about them drying out. Simply put the brush in a quart size ziplock bag and keep it in your refrigerator between coats. Push out as much air as you reasonably can from the bag. The same works for the paint roller, but use a gallon sized ziplock bag. Therefore, you can use the brush and roller as many times as you need during your flight sim painting project. Finally, then throw away the brush and roller when you’re finished. Tip 5: Why not Spray Paint? Why don’t I recommend spray paint for flight sim painting? Using spray paint on a PVC pipe frame is actually pretty difficult. It’s hard to paint pipes, because you always miss a spot and you end up applying 5 or 6 or more coats. Plus, you need adequate ventilation for spray paint. Latex primer, on the other hand, is safe to use indoors. This is especially important because many DIY builders work on their projects during the winter months. Finally, make sure you have good lighting so you can catch the drips or any areas you may have missed. This is common sense, but many people ignore it. I recommend you set up additional lights around your flight sim painting project. You can learn more about this topic and many others in the Builder Academy. You’ll also receive updates about new, free DIY Flight Sim content.